A bold statement to make, right? Especially when you look at the latest PC market share numbers, and Microsoft Surface is nowhere to be seen. Yet, the Microsoft Surface brand’s mindshare has been growing among Millennials and Early Tech Adopters. 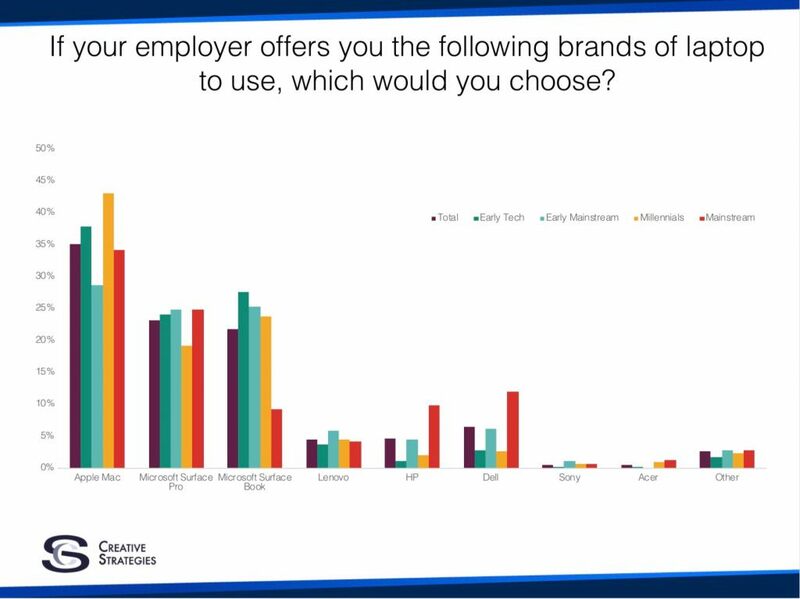 In October 2017 we, at Creative Strategies, asked a panel of 1300 US consumers about their personal and work preferences in both PC brand and workflow habits. 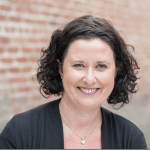 We were eager to understand how users feel about specific PCs they are given at work as well as what tools and apps they value. First things first, the industry has been talking about the death of the PC for years. Yet, especially for productivity, we are still very much bound to our notebooks. So it is no surprise that when it comes to working on a report, presentation or other projects, 81% of Americans we interviewed said they use a notebook/desktop as their primary device. Millennials too prefer a notebook or a desktop (74%), but they are the group most open (14%) to using whatever device they have at the time and often using their smartphones (or tablet) and their notebook/desktop together. This reflects how Millennials (37%) have embraced the cloud, which is a core enabler of multi-device workflows. Along with Early Tech Adopters (44%) and Early Mainstream (39%), Millennials see the benefit of the cloud precisely in the ability to access content from any device they choose. 2in1s or hybrid computers are certainly growing in popularity. Twenty-one percent of American consumers have already replaced their laptop with a Surface Pro or an iPad Pro. Another 17% is interested in making the switch to a Surface Pro and 14% to an iPad Pro. While both these families of devices support pen/pencil input, this input tool does not play a role in the purchasing decision process for 31% of consumers. “Bring your own device” is a trend that impacted enterprises across many countries, but while the direct impact might have remained mostly contained to the mobile space, the indirect effect on employees’ expectations when it comes to technology has been more extensive. Early Tech Adopters looking for a job would pass on an opportunity if the position did not offer flexible hours (60%) and if they could not choose the type of computer they would use (32%). For users of Apple products in the enterprise, the need to pick their own PC climbs to 40%. When asked to pick their PC of choice Early Tech Adopters have a strong preference for Microsoft Surface (52%) over everybody else, including Apple (38%) while Millennials and mainstream consumers see these two brands being equal. Despite the fact that most of Microsoft Surface’s sales are in the enterprise market, consumers are very familiar with the brand with only 10% of consumers not being familiar at all with the devices. Consumers who are very familiar with the name think that Microsoft Surface products are the best products with Windows software on them (21%) and this is precisely because hardware and software are optimized for each other (18%). Another 16% of consumers feel that although they are good products they are too expensive. The main differentiation against other Windows 10 devices rests in the hardware quality (36%). For some consumers (18%), the fact that Microsoft makes Surface products is a key differentiator, and for current Apple owners (36%) Surface products run the best implementation of Windows 10. When it comes to comparing Microsoft Surface to Apple products the key differentiator rests in the operating system Surface products run (43%). Current Surface users, in both personal and work, see the key differentiator being the touch and pen support (27%). Microsoft has been talking a lot lately about creativity being the new productivity, and the good news for Surface is that early adopters see Microsoft Surface as the brand that empowers them to be both productive (49%) and creative (48%). 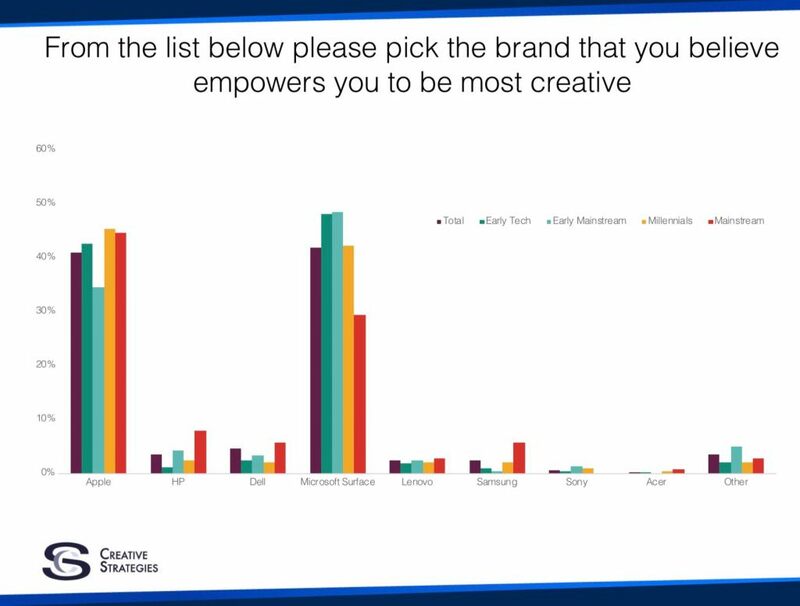 Interestingly, Millennials continue to see Apple as the brand that empowers them to be creative (45%). I am sure that such belief comes partly from the strong integration with the iPhone and the range of apps that seamlessly work across iOS and MacOS. Apps availability is something that Microsoft needs to continue to address, especially for devices like the Surface Laptop that ships with Windows 10 S as the default OS. 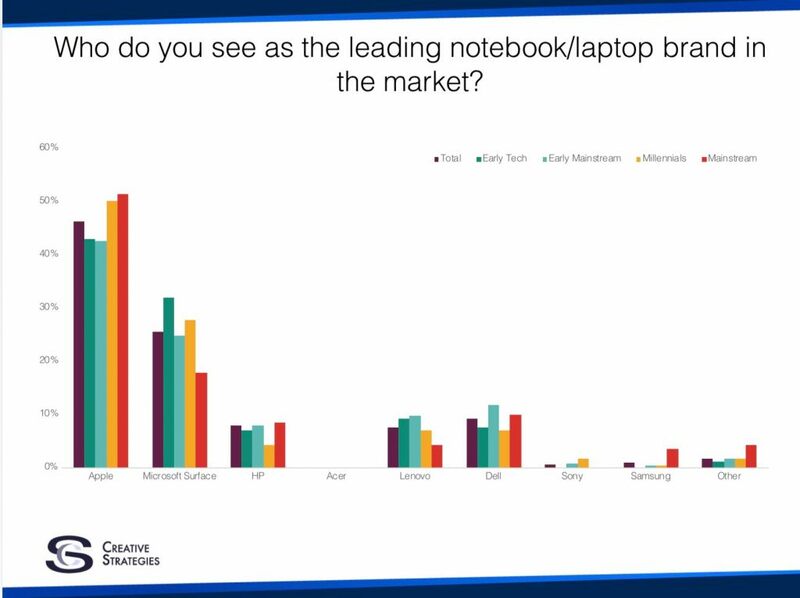 When we asked consumers who they see as the leading notebook/laptop brand in the market, the answer came across loud and clear: Apple. Forty-six percent of American consumers chose Apple as the leading brand in notebooks, although interestingly Mainstream and Millennials were stronger segments than Early Tech Adopters and Early Mainstream, categories that I am sure Apple is hoping to excite again with the upcoming iMac Pro. When we asked consumers why they picked Apple, it was mostly because “everybody seems to have one of their notebooks” (21%) and because “they have always been the most aspirational brand” (20%). Another 21% were split between an OS preference and that their products “just work.” Interestingly, to my earlier point of strong ties with the iPhone, 17% of people of picked Apple mention that as a driving reason. There is also no doubt that in consumers’ minds the only brand able to compete with Apple is Microsoft Surface, especially among Early Tech Adopters (32%) and Millennials (28%). When we asked who chose the Microsoft Surface brand why they did, 22% said it was because it is the only brand able to compete with Apple and another 21% simply said they are leaders because they are their preferred brand. Nineteen percent also believes that Microsoft Surface products offer the best implementation of Office on Windows 10. So, the moral of the study is that while overall sales might not ring any alarm bells for other PC manufacturers, Microsoft Surface quietly established itself as the most aspirational brand in the Windows ecosystem as well as the only brand able to compete with Apple. This might not translate straight away in an impact on sales, but it is likely to impact positioning and pricing on the higher end of the market where all PC vendors have been focusing more as of late.